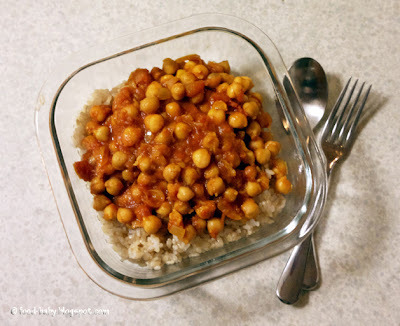 Chole Chaat is basically a chickpea and tomato curry flavoured with ginger and garam masala. It is hearty and warming and just perfect for this ridiculous cold-snap we are having in Brisbane at the moment. It is hands-down one of our favourite meals and both our boys practically lick their plates clean when we have this for dinner, which is a pretty big tick of approval! I honestly don't think I was eating chickpea curry at 19 months old! Like most curries it tastes better the next day so make it ahead of time, even a few hours, if you can. Heat the oil in a large saucepan over medium-high heat and cook the onion until golden and softened. Add the dry spices and cook 1 minute. Add the ginger, chilli and tomato and stir to combine. Add the chickpeas and 1 tomato tin of water along with the stock powder. Season with salt and pepper to taste. Bring to the boil then reduce the heat to low and simmer for 5 - 30 minutes. Serve with brown rice and a sprinkling of fresh coriander. Mmm, yummy! I've been craving a chickpea and potato curry lately, perfect for winter! Ooh chickpea and potato curry sounds perfect about now! YUM!! I love chickpeas and I love a good curry. Must pop this one on my must-try list. Thank you for sharing. Thanks Peggy, hope you do try it! This looks delicious. I often make chickpea and veggie curry from scratch, and my little 2 year old loves it! Thanks for sharing, found you through Meatless Mondays. Blessins! I love anything with curry!